... coucou Ella Coquine! Ella attended Vogue's Fashion Night Out in Paris and lived to tell the tale. It was like a scene straight out of The Devil Wears Prada... champagne, fabulousness, and bitchiness galore. Oh la la! Because I've started with France, I'm gonna stay there but I'm moving on to something that pretty much has to be the polar opposite of Fashion Week... a Troll Run. Yeah, I'm not really sure what it is either, but Amber did it while wearing a Mexican wrestling costume and it looks like a crazy fun time. So crazy in fact, I'm surprised The LPV doesn't have a Troll Run. Moving on to something a bit more high brow, Heather went to the cloister of Saint Trophime Cathedral for an exhibit about Saint Césaire, a saint from Arles. It was a special event for Heather because some of her companion, Remi's photographic works were included in the exhibit. Oh, and the Queen of Arles was there too. No biggie. From the Queen of Arles to King Harold II... The Fly Away American took us on a tour of the grounds of the Battle of Hastings and Battle Abbey. If you're an English history nerd like me, than this post is for you. If you haven't gotten your fill of history yet, then you should read Sarah's post about her visit to the Anne Frank House and if it's current events you're after, then Jay's post about the stark contrasts between elections she has witnessed since her expatriation is for you. That got heavy for a second. You know the story of how Gregory and I met right? OK, well in case you are new here and you don't, then read this, this, and this. So anyway, you know that the whole thing was cosmic kismet, the stars had to align in all sorts of crazy ways to get this American girl, and that French boy to that nightclub in Dublin so we could move to Le Petit Village and adopt a puppy that had been thrown in a trash dumpster (it's really all about Fifty). Well when I read Belinda's story about how she was on a business trip to NYC when she met her Welsh husband I couldn't help but nod along. Cosmic kismet, that's what that is. I would have enjoyed being at the Fashion escapade in Paris!! You must have had a blast .. people watching galore! I'll off to read ~ creating an e-Book! I seriously love it when you do these! I always find a new blog to start reading! Belinda's love story is so similar to yours! I love it! 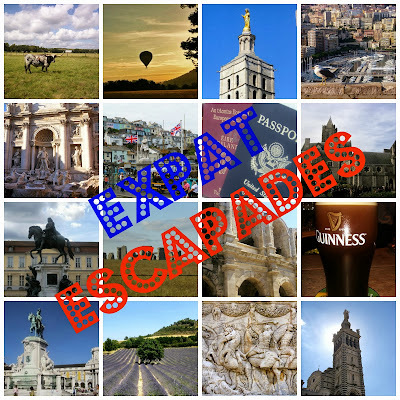 I'm really lovin' your Expat Escapades series!!! Thanks again Sara! Love this series! Yep! I hope you keep these coming! So fun to read! Love the expat round up! Especially the fashion week one...if only! Round seven already - time flies! A few links have caught my attention in particular - the visit to Anne Frannk's house and Vogue's Fashion Night Out to start with - two very different topics there! Thanks for all the awesome links! I really love your posts, keep them coming!